Come With Us On A Dazzling Adventure To The Bead and Button Show! Wow! What a whirlwind adventure at the 2015 Bead and Button Show! As you all know this was my very first trade show and it was a fabulous experience! I grew up helping my parents with their booth at arts and craft shows around the Southwest (I was such a youngster in this biz, I spent my youth with a baby bottle in one hand and a crystal in the other) Needless to say, it’s in my blood and I feel at home meeting and helping all of our wonderful customers in person. I want to shout it from the roof tops…THANK YOU to our FANTASTIC customers!! I want to sincerely thank each and everyone of you who stopped by, called in or emailed me words of support. Your feedback was overwhelmingly positive and it meant the world to me!! 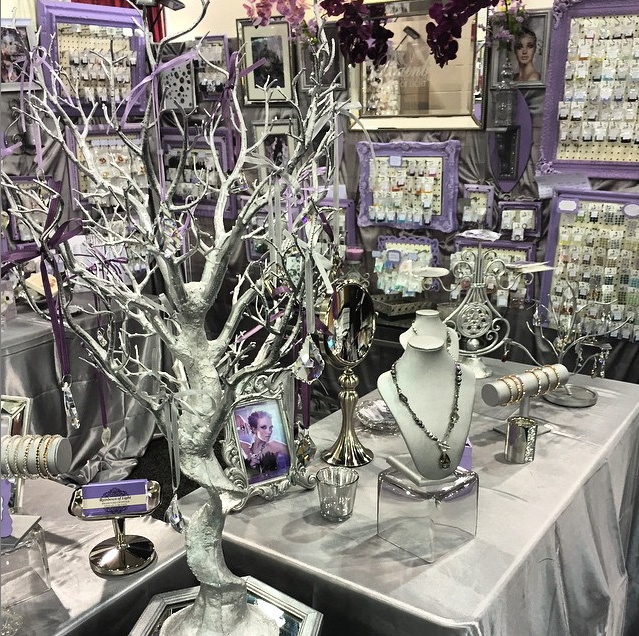 Everyone loved the sparkly booth and seeing your smiling faces in person made it all worthwhile! My soon-to-be sister in law Breanna from Crystal Princess and I had a ball together! We were catching up and laughing together the whole trip. She was a huge help, bringing beautiful jewelry and working with customers giving top-notch service with her gorgeous beaming smile! She has been making custom handmade jewelry for many years now and has extensive knowledge with all of Swarovski’s products, which was a major plus. Who knows, maybe one day she could work for us full time…now that would be a dream come true! People loved how they could see all of the crystals hanging up instead of sifting through trays on a table. They also loved that many frames were organized by complimentary color combinations and not just by one style, that way they could create jewelry in their favorite color palette by incorporating unique styles they had never thought of before. Look at this beautiful surprise I received from my super duper, always supportive, absolute best hubby in the whole world!! He’s also the most hilarious, best friend and co-owner anyone could ever ask for!! As I was preparing for the show, I was watching a lot of Ted Talks (I find them endlessly fascinating & learn so much). I watch one entitled “The Key to Success? Grit” Afterwards, I excitedly told Mike, that’s me, I have so much Grit! From then on, my new nickname has been “Lil’ Grit” Needless to say, I was dying laughing when the flower delivery man came to the booth asking for “Mrs. Lil’ Grit”…oh boy, too funny. Time certainly flies when you’re having fun and after 18 years together, it just keeps getting better! This necklace sure received a lot of oohas and aahs. I made it using the Swarovski 6106-38mm Pearshape Pendant in the new Black Patina finish. It captured the attention of many until it was joyfully bought by Gene, our very friendly AirBnB host. The new Swarovski Crystal Stretch Bracelets were a smashing hit! From young to old and from bead store owners to beginners, these little sparkling beauties were all the rage! They are certainly eye catching. I would definitely recommend them to re-sellers and jewelry enthusiasts alike. They make perfect gifts as well because they are 7 inches and stretch to fit most wrists sizes. Thanks again for all of your love & support, I take it to heart and sincerely appreciate it!